That news is sad but understandable. It is sad. Larry rebuilt a Ruckstell for me many moons ago. We all face the day when we no longer will be able to work on the cars that we love. I have a good friend that is having to sell is car because he no longer can drive it. I bought my car from an 85 year old who felt it was time. I am not sure where my car will go (in 10 or 20 years) as no one in the family has an interest in it. 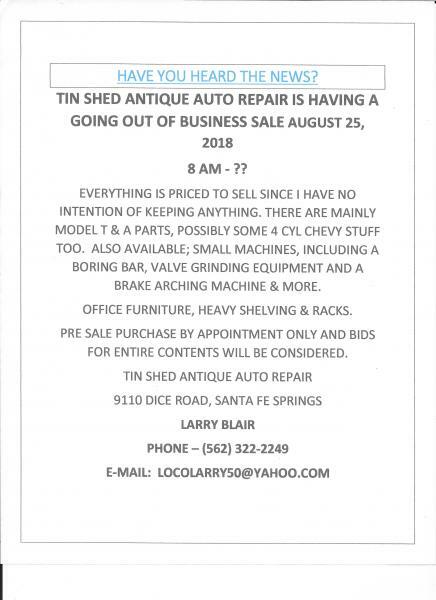 Too bad Tin Shed isn't located near me. But then again it would just clutter up my tiny garage and add to the things that my kids would have to get rid of.